For the past few years we've been documenting some of the historical markers that we come across on our travels across the great state of Pennsylvania. Hundreds and sometimes thousands of people drive by historical markers and never look at them or read them. Historical markers are about our forgotten past and it's a history that's worth remembering and learning about. 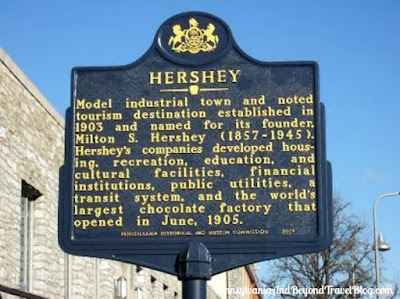 The HERSHEY historical marker is located on 19 E. Chocolate Avenue in downtown Hershey, Pennsylvania. Here's what it says. Model industrial town and noted tourism destination established in 1903 and named for its founder, Milton S. Hershey (1857 - 1945). 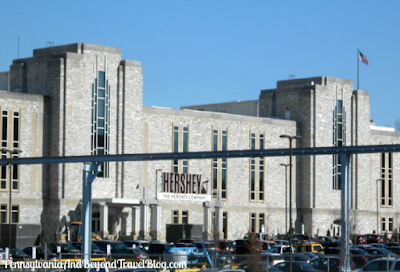 Hershey's companies developed housing, recreation, education, and cultural facilities, financial institutions, public utilities, a transit system, and the world's largest chocolate factory that opened in June, 1905. At the bottom: Pennsylvania Historical and Museum Commission 2003. 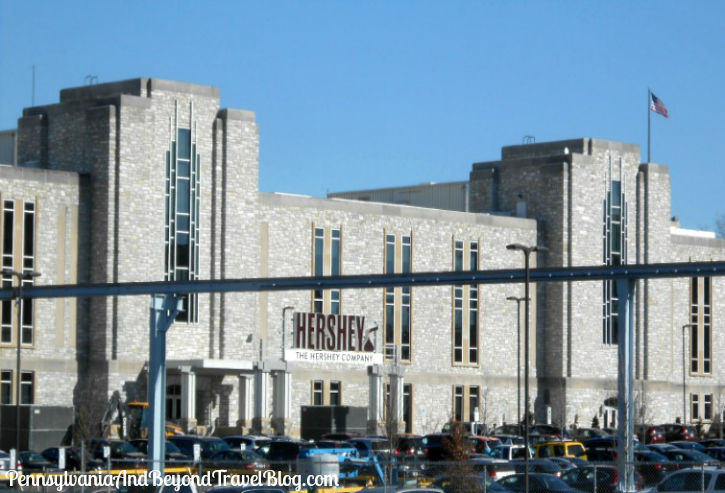 Milton S. Hershey was the founder of The Hershey Chocolate Company. The town is named after him along with many of the tourist attractions. For example: You'll find The Hershey Gardens, The Hotel Hershey, the Hershey Lodge, Hersheypark, Hershey Chocolate World, the Hershey Theatre, the Hershey Chocolate Company and many more! 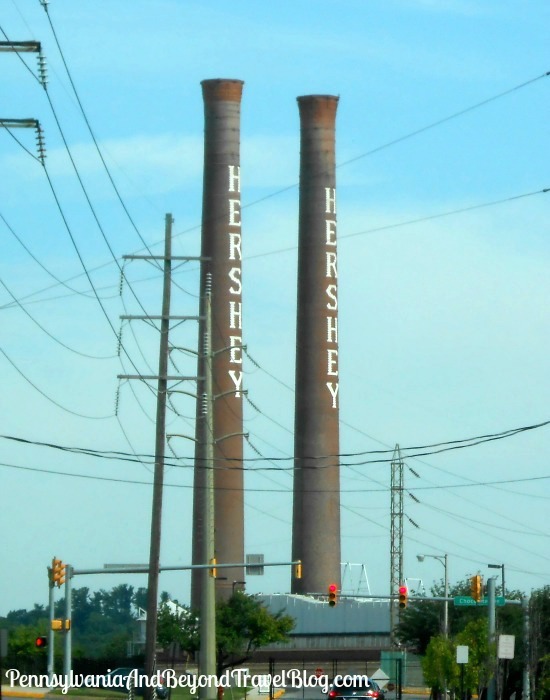 When you visit Hershey in Pennsylvania, you'll notice as you drive through the downtown area that all of the street lamps are done in the shape of Hershey Kiss chocolate candies! The town is known as the "Sweetest Place on Earth" and I have to admit...it is! It's one of the prettiest towns in the entire state and it's one of our favorite places to visit. 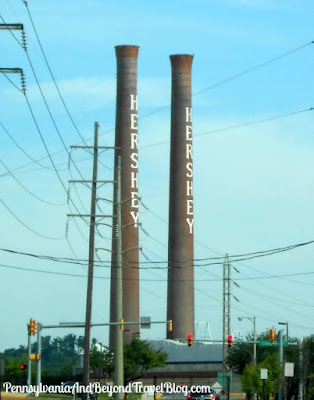 A few more things that you'll notice as you drive around the downtown area is the Hershey Kissing Tower, the two Hershey Chocolate Factory Smoke Stacks and if you're really lucky, you may see the Hershey Kissmobile or Hershey Trolley riding by. Plus, there are several more historical markers nearby, if you want to check them out. If you're looking for some fun things to do, places to eat or nice places to stay during your trip to Hershey Pennsylvania, you can find our personal recommendations for all of those right here on our Pennsylvania and Beyond Travel Blog.